On Monday, June 24th U.S. Senator Tim Kaine met with a group of administrators, students and financial aid officers at J. Sargeant Reynolds Community College to discuss the pending hike in interest rates on undergraduate subsidized Stafford loans from 3.4% to 6.8%. Of the approximately 19,000 students attending Reynolds, about 3,900 currently have at least one Stafford loan. The interest rate increase would not affect existing loans, but would take effect for new subsidized Stafford loans originated for the 2013-2014 school year. Kiesha Pope, Reynolds’ director of financial aid, noted that for a $3,500 Stafford loan the higher interest rate would equate to increased interest costs of about $540.00 over the life of the loan. Senator Kaine added, “"Most of these folks will take out loans for multiple years so now you're talking about adding thousands of dollars of interest payments." Kaine noted that there are four other proposals under consideration including floating the interest rates with the state of the economy, and placing ceilings on rates and that most likely the final bill will include elements of all the proposals. The students in attendance expressed concern about the interest rate hike. They told Kaine they want to get an education, find a good job, buy homes and cars and contribute to the economy, but they feel like the difficulties of paying for that education will delay their ability to do those things. Senator Kaine thanked the participants for their participation and their willingness to discuss the issues they are wrestling with. He told the group he is hopeful that a resolution on the interest rate will be reached this week before the July 1st deadline. Anyone who spends much time around J. Sargeant Reynolds Community College knows that President Gary Rhodes has a thing for bow ties and that he sports them on a regular basis. When it recently came to light that Reynolds graphic designer Leslie Bax’s 14 year-old son Axel shares a similar passion for bow ties, Dr. Rhodes knew he had to meet Axel and invited Leslie to bring him to campus this week. Axel, a rising high school freshman at Atlee High School in Hanover County who hopes to become an architect or engineer, discovered his love for bow ties on a shopping trip with his father. When Axel admired the display of bow ties at a men’s shop and the salesman offered to give him a quick lesson in the art of tying a bow tie, Axel gladly took him up on his offer. During their visit Dr. Rhodes gave Axel and his Mom a tour of his office and the two bow tie aficionados discussed the benefits and merits of bow ties at length. At the conclusion of the meeting Dr. Rhodes told Axel that he is bequeathing his entire bow tie collection of 80 ties to Axel as his own son doesn’t appreciate the charm of bow ties to the extent that Dr. Rhodes does. Axel, whose collection of 3 bow ties is just getting off the ground, was pleased to accept the gift. The J. Sargeant Reynolds Community College Police Department has achieved accreditation status from the Virginia Law Enforcement Professional Standards Commission (VLEPSC) for its commitment to law enforcement excellence and the successful completion of the certification process through the Virginia Law Enforcement Accreditation Program. The Certification of Accreditation was formally presented to the College on June 11th by the Department of Criminal Justice Services VLEPSC Program Manager Gary Dillon. Of the more than 400 municipal police and sheriff’s departments in the Commonwealth, only 87 currently hold the distinction. 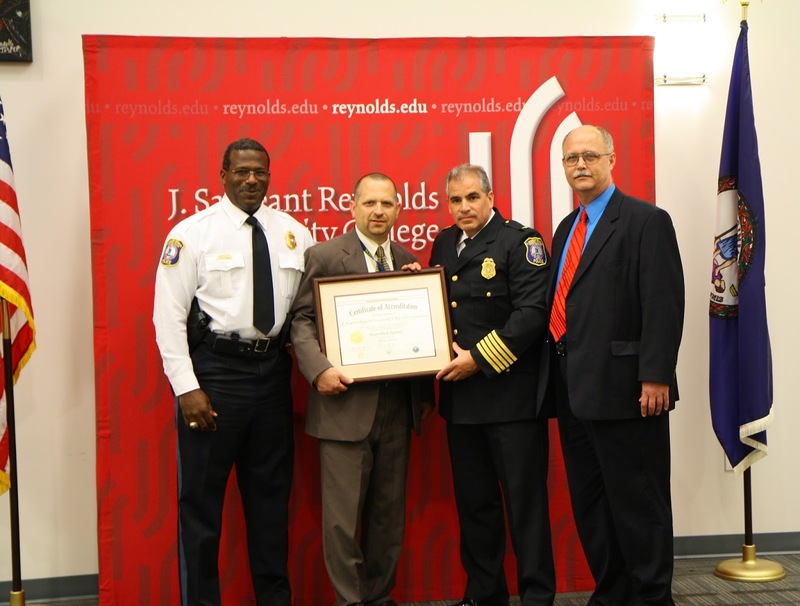 The JSRCC Police Department is the only community college in Virginia to hold the accreditation. Accreditation of a police department by VLEPSC indicates that the department is in compliance with 187 professional law enforcement standards in four topic areas; Administration, Operations, Personnel, and Training. 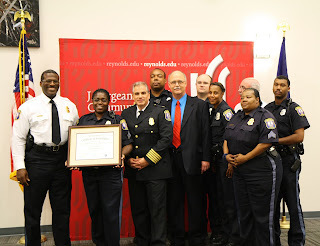 The certification signifies that JSRCC police have met the highest standards for law enforcement practices in Virginia. The accreditation process began in March 2011 with a self-assessment, and culminated with a three-day on-site assessment of the department’s policies, procedures, processes and operations by members of the Virginia Law Enforcement Accreditation Coalition in late April. JSRCC’s police officers serve a population of more than 21,000 students, faculty and staff. The department has jurisdiction over all three campuses and the Ginter Park Center. The department will be reassessed by the state every four years and must provide proofs of compliance for each calendar year.